Our classes bring language to life through engaging conversations, stories, music, and readings you’ll understand—100% of the time. You build your fluency in a supportive and fun community of fellow French students. Our beginner classes are designed for students new to French as well as those who have studied in the past but would like to gain more confidence. (Perhaps you studied for years in school and have a lot of vocabulary stored away but you struggle to have a conversation?) 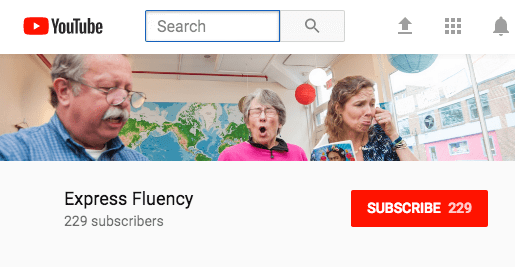 Classes are supplemented by readings and audio recordings.The class draws upon the latest language-acquisition research to get students speaking French comfortably– right away. Express Fluency students receive a special rate from the Latchis Hotel, right around the corner from classes. Contact the Latchis directly. Other downtown Brattleboro lodging suggestions can be found here. Outside of school, Allison enjoys spending time with her family, friends, and dog, traveling, watching movies, running road and obstacle races, cooking vegan food, and reading. She is excited to work with adults through Express Fluency this spring! Allison surpassed our expectations for our French intensive weekend. She was undeniably well prepared & engaging the entire weekend. She is a dynamic & supportive educator & we all benefited from the weekend French immersion. It was a really good weekend of immersing myself back into French after a long absence. Allison was a great teacher. In spite of my rustiness, I found that I was advanced relative to the rest of the class. She was able to concoct ways to keep me active and on my toes while not leaving those at a beginner level behind. I would do this weekend again. Such a fun class! Allison has a very comfortable and engaging style that makes it easy to participate.